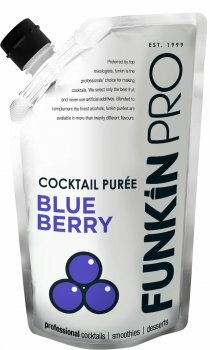 Funkin's wild blueberries are sometimes difficult to get hold of, but they believe the best blueberries grow on the lower reaches of the mountain slopes in Eastern Europe. Funkin's blueberries grow wild and taste divine - well worth all that climbing! Details : Blueberries from a number of Eastern European countries. Funkin's Blueberry premium puree, used by the UK's top A-list style bars and chefs, and consisting of the finest globally sourced fruits.